It can be fun for chefs to clip new and exotic recipes from newspapers: the ostrich liver pâté, a custard chicken, miso-flavored bison, thyme-Jello and other slightly wacky combinations can help to keep the palette adventurous. But when a dinner party is in the offing, out come the classics from Julia Child’s “Mastering the Art of French Cooking” or Jacques Pépin's “Complete Techniques,” books that have survived the cull and so give the chef a margin of comfort beyond passing tastes that have already passed. Such is the experience of wandering into the more staid of the two piers at The Armory Show, “Pier 92 – Modern,” where work that has survived north of 30 years or so awaits. Ironically, the term “modern art” generally means art prior to post-modern, which itself is defined as after modern, which is largely undefined but could mean art made in the west after 1870 that looks modern but not art made after 1870 in the west that doesn’t look modern. I hope that clears things up. The competition to get into this fair was fierce, with more than 700 applications winnowed down to 205 by the time of the last headcount. With galleries arriving from 36 countries, getting caught in the Kafka maze of U.S. Customs is a regular event and it’s a miracle that so much engaging artwork got through. There are a few galleries of note that are not in evidence, such as the Gagosian mega-gallery, but visitors will still find a number of excellent modern offerings throughout. Given the current staggering market prices for major works by the most renowned artists—many of whom are represented on Pier 92—much of the work on view is at the lower end of the price spectrum, which is to be expected at any fair. The following are but a few examples of the vast offerings of art of the modern period available on Pier 92. Taken as a whole, the experience of roaming the show offers substantial aesthetic rewards while offering a scattershot survey of an impressive slice of art history. “Vier Wassertürme” by Bernd & Hilla Becher,1969. Exhibited with Ludorff Gallery of Duesseldorf. A curious and influential German photography movement formed in the 1960s, known as the Becher school after its founders Bernd and Hilla Becher. Their work is in evidence courtesy of Galerie Ludorff of Duesseldorf. The Bechers photographed industrial structures that loomed about the scenery—concrete and steel mammoths that endured from an earlier time—often seeking out those in a grid. Their teaching efforts spawned a remarkable following of successful photographers, including Andreas Gursky—who recently mounted a stellar show at the Parrish Art Museum in Water Mill—Candida Höfer, Thomas Ruff, and Thomas Struth. Most of these photographers became market darlings as well. On the other side of the noosphere, the Howard Greenberg Gallery has Helmut Newton showing strong women au naturel, as in a Vogue Magazine shot of actress Charlotte Rampling sitting on an ornate table at the Hotel Nord, 1973. Her drink and cigarettes are handy and her pose and stare says she is up for anything. “Charlotte Rampling at the Hotel Nord” by Helmut Newton,1973. Exhibited with Howard Greenberg Gallery. British painter Lucian Freud is a great figurative artist with an immense following who was always going in and out of style in his 70 years of working. He died in 2011 at the age of 89, leaving a large body of work that the art world powers are still digesting. At The Armory Show, London’s Osborne Samuel Gallery is showing a group of Freud etchings, studies from or for larger paintings. A standout is one of the artist’s mother. “The Painter's Mother" by Lucian Freud, 1982. Exhibited with Osborne Samuel Gallery. An artist who has been every sculptor’s hero and a surprising market darling as well is Swiss artist Alberto Giacometti. His L’hommme au doigt sold at Christie’s for $126M last May, making it one of the most expensive ever. His work became tied to the dark European philosophy movement known as existentialism. Gana Art, a New York based mostly Korean gallery, is showing Giacometti’s La Place, which is a small edition and an image typical of his best work of walking man. For this reviewer, the piece is probably the best work on the pier. “La Place” (ed. 4/6) by Alberto Giacometti, 1948. Exhibited with Gana Art. A significant polished bronze work typical of Lucio Fontana’s oeuvre, Concetto Spaziale ‘Natura, 1967, is offered at The Armory Show by Vivian Horan Fine Art. Fontana has an odd place in art history because he doesn’t seem to fit anywhere but is generally liked. Originally from Argentina, he went back and forth to Italy where, for reasons unclear, he was associated with Arte Povera. Nonetheless, with his preferred material of polished bronze, he is virtually the mirror opposite of that art-from-nothing crowd. “Concetto Spaziale ‘Natura’” by Lucio Fontana, 1967. Exhibited with Vivian Horan Fine Art. To read James Croak's review of the Contemporary section of The Armory Show, click here. James Croak is an American sculptor working in conceptual figuration and an art critic for Hamptons Art Hub. BASIC FACTS: The Armory Show is held March 3 - 6, 2016 at Pier 94 and Pier 92, 711 12th Avenue, New York, NY 10019. The Armory Show's Contemporary Section is held in Pier 94 and its Modern Section held at Pier 92. Hours: Thursday - Sunday, noon to 7 p.m. Admission: $45 or $60 with VOLTA Admission. 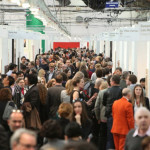 www.thearmoryshow.com.